The other day there was a flock of geese flying over our house. I noticed that one of them broke off from the rest and was circling back in the direction they came from. I couldn't figure out why it was doing that until I noticed another goose headed in the opposite direction from the flock. The goose that broke off from the flock went back and got the errant goose directing it back to the rest of the flock. I thought of this reading which is one of my favorites. I hope you enjoy it too. As each bird flaps its' wings, it creates an uplift for geese following. By flying in a "V" formation, the whole flock adds 71% greater flying range than if each bird flew alone. LESSON: If we have as much sense as a goose, we will stay with those who are headed in the direction we want to go, and be willing to accept their help as well as to give our help to the others. LESSON: It pays to take turns doing the hard tasks and share leadership. People, as well as geese, are dependent upon each other. 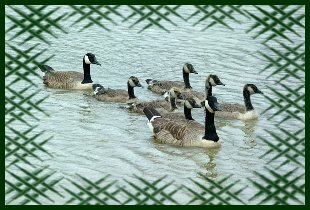 When a goose gets sick or wounded or shot down it honks for help and two geese drop out of formation and follow it down to help protect it. They stay with the sick goose until it is able to fly again or it dies. Then they launch out on their own, or with another formation, or catch up with the flock.